August 15th, 2016. 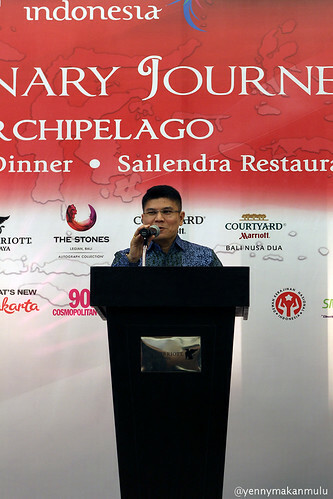 I was invited to Indonesia Culinary Journey – Flavors of the Archipelago. 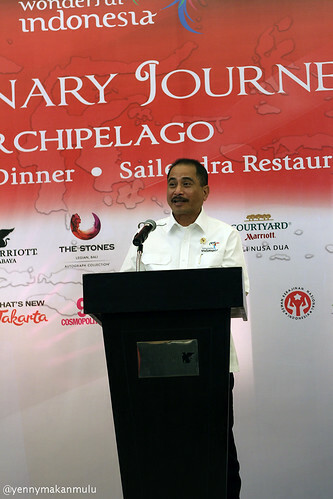 It’s an Exquisite Culinary Collaboration of Seven Marriott’s Hotels in Indonesia Celebrating RI 71st Independence Day. 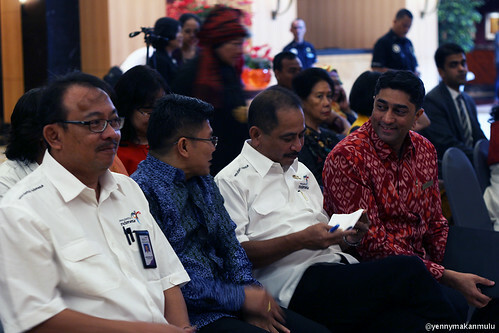 Just in time to mark the Indonesia’s 71st anniversary of independence, the roadshow is launched at JW Marriott Hotel Jakarta on Monday, August 15, by the Minister of Tourism Bapak Arief Yahya, along with the General Manager of JW Marriott Hotel Jakarta, Mr. Karan Berry and Vice President Corporate Communications of Citilink Indonesia, Bapak Benny S. Butarbutar. The event begins with singing the national anthem Indonesia Raya and continued with traditional West Sulawesi dance performance, tari Patuddu by Dinas Pemuda Olahraga dan Pariwisata Provinsi Sulawesi Barat. 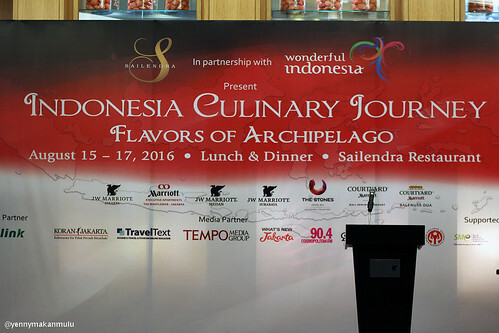 The ceremony marks the beginning of Indonesia Culinary Journey – Flavors of Archipelago, where the seventh winning chefs will serve their dishes at Sailendra Restaurant from 15-17 August 2016. With priced of 400k nett per person, this offer is available for lunch and dinner. From August 15th to September 6th, 2016. Chefs from JW Marriott Hotel Jakarta, The Mayflower, Jakarta – Marriott Executive Apartments, JW Marriott Hotel Medan, JW Marriott Hotel Surabaya, Courtyard by Marriott Bali, Seminyak, Courtyard by Marriott Bali, Nusa Dua, The Stones, Legian, Bali – A Marriott Autograph Collection Hotel, will join forces and bring a special gastronomic collaboration to celebrate the country’s culinary heritage. One chef from each hotel will visit all seven hotels to feature all seven dishes in the restaurants for guests to enjoy. Inspired by the true concept of a classic seven course, each hotel will prepare one course of this grand menu to represent their hotel during the promotion. 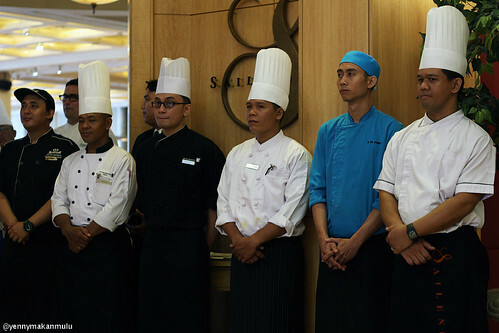 At the preliminary stage to this enticing roadshow, internal competitions were held at each hotel in search of the most authentic and unique Indonesian dish. 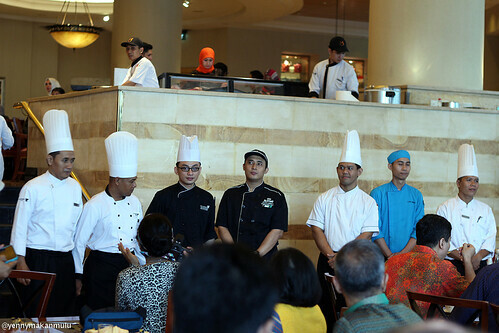 The seven chefs along with the winning dishes will then join the culinary journey to represent their hotels across Indonesia. 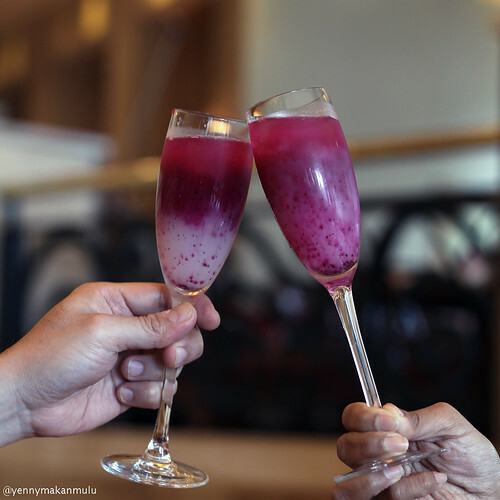 On August 16, 2016, to the Sailendra guests who dine and dressed with Indonesian traditional clothes such as batik or kebaya can join the Instagram contest by visiting the JW Marriott Hotel Jakarta Instagram page (@jwmarriottjkt), can get a chance to win a weekend stay and dining voucher at JW Marriott Hotel Jakarta. On August 17, 2016, JW Marriott Hotel Jakarta will be having “Spirit To Serve” initiative by inviting 10 children from Emmanuel Foundation to do some interesting activities along the Chefs. 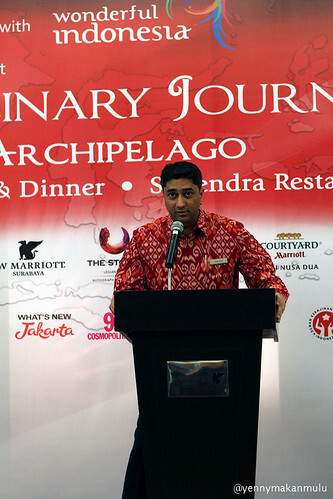 The culinary journey will then continue to JW Marriott Hotel Medan from August 23rd to August 25th. 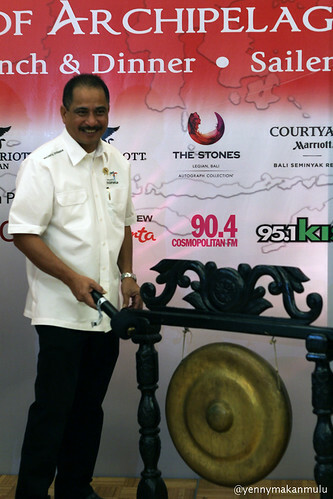 Next destination will be JW Marriott Hotel Surabaya, from August 27th to August 29th. The final course of the journey will take place in the island of Gods starting from Courtyard by Marriott Bali, Seminyak from August 30th to August 31st, Courtyard by Marriott Bali, Nusa Dua from September 2nd to September 3rd, and finally The Stones, Legian, Bali – A Marriott Autograph Collection Hotel from September 5th to September 6th. 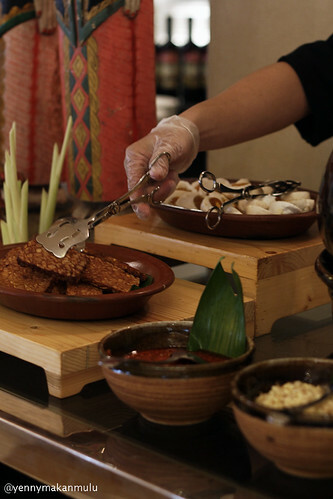 Chosen by a group of food experts and local chefs, the seven featured dishes have been picked to showcase the true authentic flavor of Indonesia across the Marriott hotels in the country. 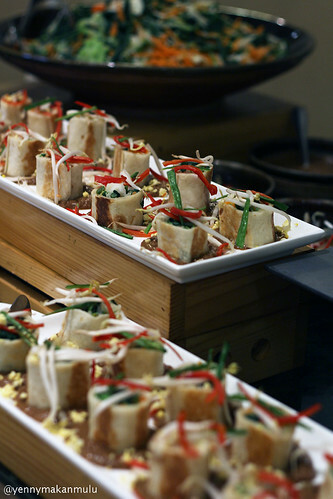 The featured salad dish is Spicy Gado-Gado Torti Roll, a special creation by Chef Andi Setiawan of The Mayflower, Jakarta – Marriott Executive Apartments. 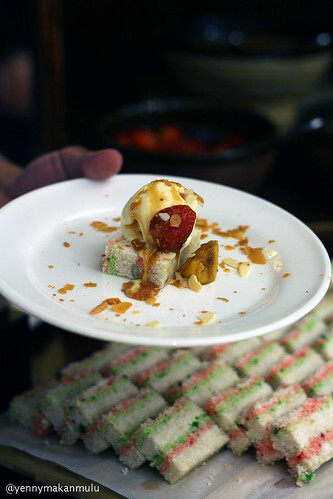 The dish is a refined transformation of one of Jakarta’s signature dishes and his grandmother’s recipe of Gado-Gado; it’s Gado-Gado in one bite. Continuing to the soup component of the offering, diners may enjoy another classic Indonesian dish originated from East Java, Rawon Iga (Beef ribs black soup). Adding a more contemporary twist to the dishes, Chef Vaulanda of JW Marriott Hotel Surabaya will assure that these would be one of the diners’ favorite. 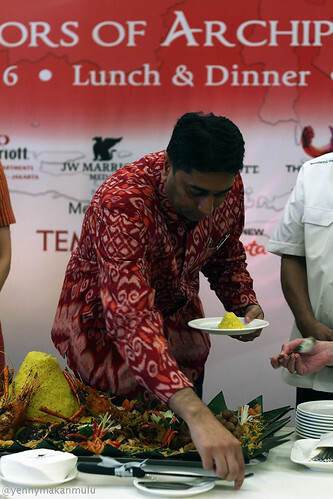 Inspired by Andaliman, which is the one of the spices that represents Medan, Chef Broto of JW Marriott Hotel Medan will bring Ikan Gerapu masak arsik khas Toba (Crispy grouper fish in Toba Arsik style). 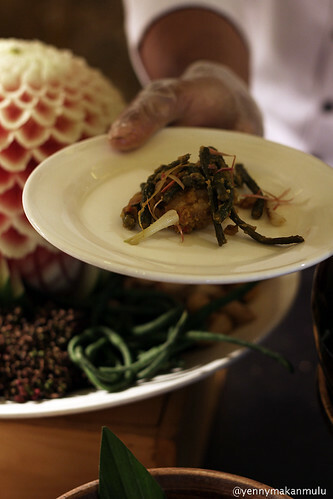 The unique flavor of Andaliman mixed with traditional spices would complement the fish perfectly. 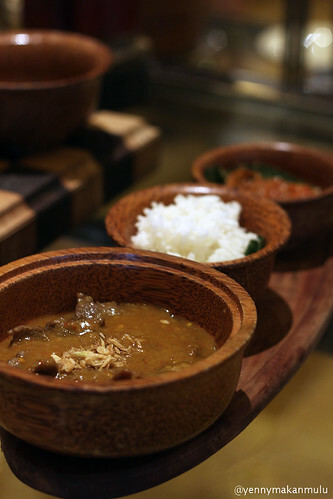 The dish offers an original taste of Bataknese / North Sumatrans cuisine. Inspired by his love for Durian, Chef Deni Purwanto of JW Marriott Hotel Jakarta will bring his mother’s recipe Gulai Daging Masak Tempoyak (Sweet and sour beef and fermented durian curry), a dish that he always enjoy eating as a kid. Tempoyak is a condiment made from fermented durian, commonly used in the western part of Sumatra including his mother’s hometown, Jambi. Ready to represent the exotic flavors of Bali, Chef I Nengah Mingguana of Courtyard by Marriott Bali, Seminyak will bring his creation of Ayam Kuah Becundang (Stewed Chicken Kampong “Rooster” Soup). 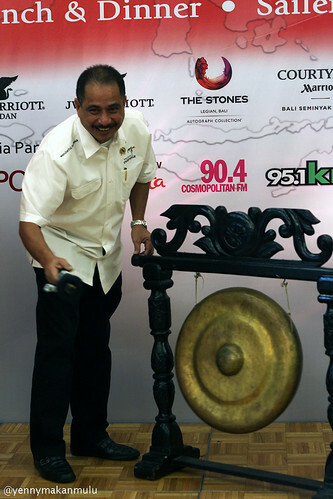 This came from traditional recipe in Bali from many generations before him. 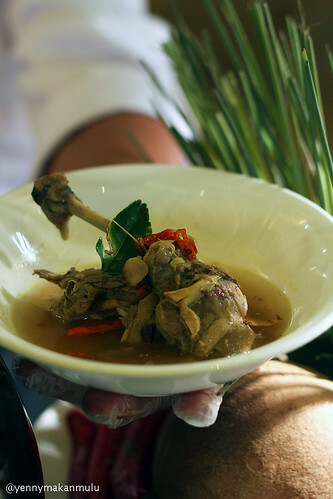 Balinese people usually use chicken kampong “Rooster” meat and cook it as soup. It takes around 60 minutes to make the meat tender, juicy and ready to serve. Rounding up the main course component, Chef I Made Dewa Suardi Yasa of The Stones, Legian, Bali – A Marriott Autograph Collection Hotel will bring his grandmother’s Yuyu Palem Telengis Mepes Nasi Oran Jagung (Mixed Steamed white rice and Sweet Corn), Lawar Kelungah (Young Coconut and Soft Shell Crab Salad), Sambal Sere Tabiya (Chili with Shrimp Paste). 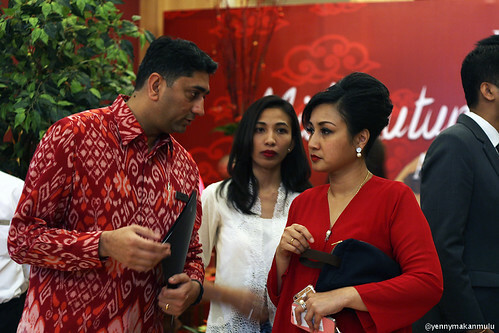 The dish came from his grandmother and it is very famous at Yeh Embang, one of village in Negara, West of Bali, where his grandmother used to live. As the sweet end of the meal, Chef I.B. Oka Yudha Pratama of Courtyard by Marriott Bali, Nusa Dua will prepare Abug with Burnt Coconut Ice Puter and Caramelized Banana. Abug is one of the many traditional Indonesian cakes that originated from Karangasem regency in Bali originally made from steamed sticky “ketan” rice flour, grated coconut and sugar or sometimes palm sugar. 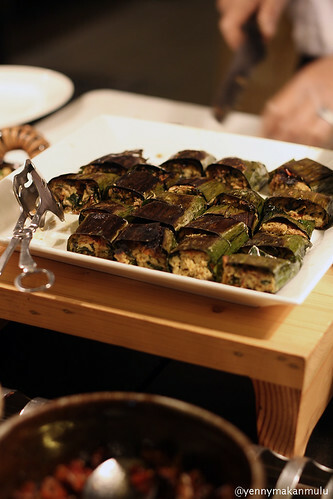 This dish usually served with coffee or tea during friends or relatives’ visit. Chef Oka creates a modern look to the chewy-crumbly texture snack to make it popular among the younger generation. 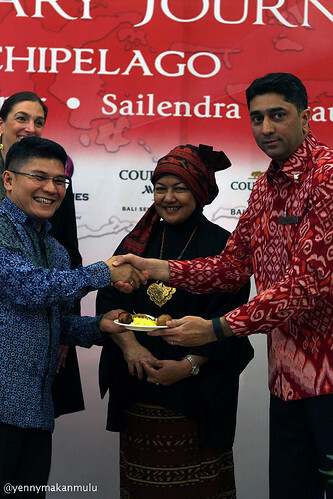 Cheers to Indonesia Culinary Journey! !